Dave Gross: In 2008 I visited the World Fantasy Convention in Calgary. It was mainly a social trip to catch up with some old friends. Two of them were also former colleagues from Paizo, Director of Sales Pierce Watters and Publisher Erik Mona. Erik mentioned his plans to start a Pathfinder Tales line and asked whether I’d be interested in contributing. Already I loved what I’d seen of Golarion. The world was vast and varied, like the Forgotten Realms, but unburdened by a long history with the occasional apocalypse. The prospect of acting as a, well, pathfinder in a relatively fresh setting was too sweet to pass up. Since it would be another year before they were ready to solicit novels, Fiction Editor James Sutter invited me to pitch a novella for the Council of Thieves Adventure Path. He liked the idea that eventually became “Hell’s Pawns,” the first Radovan & the Count story. When it was time to launch the novels, he asked me to pitch an idea with the same characters. 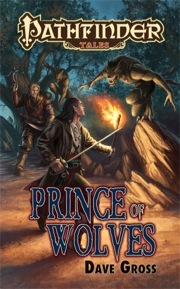 That became Prince of Wolves, the first book in the Pathfinder Tales line. FR: Your upcoming release, Master of Devils, is your second novel featuring Count Varian Jeggare and his bodyguard Radovan, but it’s several novels into the Pathfinder Tales series. 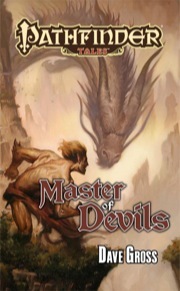 What should readers pick up before reading Master of Devils? DG: Not a thing. In August the novel, a short story at paizo.com, and a new six-part novella in the Jade Regent Adventure Path all come out simultaneously. You can read them in any order without suffering major spoilers. For fans of chronological order, the sequence is: “A Lesson in Taxonomy,” “Hell’s Pawns,” “The Lost Pathfinder,” Prince of Wolves, the as-yet-untitled web story for August, “Husks,” and then Master of Devils. 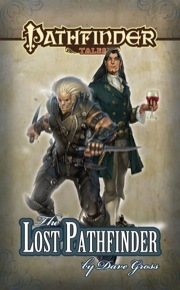 The earlier stories are available at paizo.com in various formats, several of them for free. FR: When you’re writing in the Pathfinder universe, how much do you think about tying the story into the game, or vice versa? DG: In the beginning, I think much more about the setting than about game mechanics. It’s uninteresting to me to place any fantasy story in Golarion; I want to write a story that belongs there. So I research the setting the way I would research Medieval France if I were writing a Carolingian romance. For Prince of Wolves, the homework started out pretty easy. The Principality of Ustalav existed in only six pages of description, but it was evocative stuff. My favorite parts of those pages went into my brainstorming notes. I knew I wanted to include the worship of the prominent deities of the region, and there was much more material on them in other game books. When I read the description of the courtly intrigue in Caliphas, I knew I had to include several noble schemers as supporting players. Virtually every character and event in the novel comes from my imagining what would “feel true” in this corner of Golarion. At some point I start thinking of ways the game mechanics can help tell the story. For instance, Pathfinder Harrowers are fortune-tellers, usually frauds but sometimes “True Harrowers.” Deciding that one of my characters is a phony who is as surprised as anyone else when her cards prove prophetic was a fun way to suggest the hand of fate while leaving doubt in the minds of characters and readers alike. I also like to bend the rules when it adds mystery without detracting from the logic of the setting. So my unexpected “True Harrower” turns up a card that doesn’t exist in the standard Harrow deck, and one of my protagonists discovers an unorthodox method of casting spells. Master of Devils was a different situation. The novel had to be finished before the setting was complete. Fortunately, the Paizo creative team entrusted me with one of the Successor States of Imperial Lung Wa, and I ended up contributing three countries to the setting book. While kung fu movies inspired the action scenes, I often paused to think of whether the extraordinary moves were things characters can do in the game—like snatching an arrow out of the air or fooling an opponent with a feint. When the action didn’t fit the rules, sometimes I altered the scene to make it more “believable” to a Pathfinder player. But sometimes I left it more true to the movies and trusted that a designer would sweep in behind me and, for example, add Burning Cloud Devil’s flying fireball to a later supplement. FR: On your blog over at the Alliterates, you’ve reviewed several kung fu movies recently as a tie in to your new release, since Master of Devils takes place at a warrior monastery in Pathfinder’s Asian-flavored setting. Could you talk a little bit about your inspiration, and about any challenges you encountered tying your cinema inspirations into the Pathfinder world? DG: After I finished Prince of Wolves, James Sutter and I chatted about what the boys might do next. At PaizoCon 2010 we spitballed various ideas, but none of them stuck. Then I remembered that the Tian Xia setting would come out about a year later, around the time I could finish another novel. I’m a huge dork for Asian cinema, so my hand shot up like Arnold Horshack’s, “Ooh, ooh, ooooh!” We caught Erik Mona outside the lounge, he gave us his blessing, and five minute later we had a plan. Since the Adventure Path takes characters to Golarion’s version of Japan, James preferred that I set the novel elsewhere in Tian Xia. That was perfect for me, since I love Chinese wuxia movies (let’s call ‘em “kung fu movies”) even more than samurai films. Taking inspiration from these films was the opposite of a challenge. More than anything from Hollywood, kung fu movies capture the essence of fantasy roleplaying. Also, it was no great hardship to revisit scores of my favorite films and discover a few dozen more as I did my research. 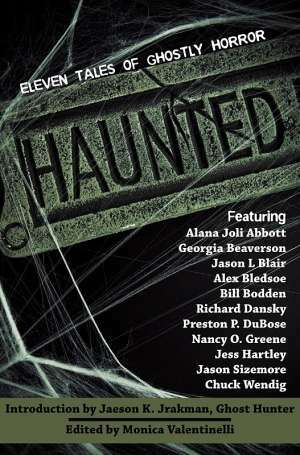 For those who’d like to explore them, I’ll post more movie recommendations on my site and others over the next weeks. Many kung fu films include the amazing fight scenes for which the Shaw Brothers became famous. Some are more romantic, like King Hu’s classics or Zhang Yimou’s marriage of wuxia and art-house. Others are full of over-the-top magic and supernatural creatures, like the fantasy films of Tsui Hark. I wanted to reflect all three of these sub-genres, but I didn’t want to jumble a plot with conflicting tones. Thus, Radovan’s journey takes him all over the countryside, where he faces deadly martial arts masters. Varian’s story, told mostly at Dragon Temple, contains more romance and intrigue. And for the really crazy supernatural stuff … well, I don’t want to give away the surprise to those who haven’t already heard the readings, but the third point-of-view character goes places and meets beings that the other two can’t. Near the end, these separate worlds gradually blend into each other before they finally converge. The fun of plotting Master of Devils was that there is ultimately only one story, just many different paths by which to reach it. FR: For people who aren’t familiar with Paizo’s Adventure Path monthly resource, can you talk a little bit about how the novellas you’ve written to tie into the adventure paths have worked? 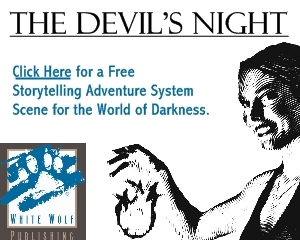 DG: The novellas appear in installments within the Adventure Paths, six chapters each. The one thing the fiction and the adventure have in common is the general setting. Thus, the events of “Hell’s Pawns” take place in Cheliax, but in the city of Egorian rather than Westcrown, where the events of Council of Thieves occur. Likewise, “Husks” occurs in Minkai, but in a different city from the final chapters of Jade Regent. I know practically nothing about the adventures when I pitch the story, so any connections of theme or other elements are entirely coincidental. FR: If you had to pick your top five kung fu movies that everyone should watch, what would they be? DG: I use the term “kung fu movie” pretty loosely, but the dangerous word here is “favorite.” I wouldn’t necessarily recommend my favorites films to everyone, and my top picks change frequently. I’ve recommended “essential kung fu movies for gamers” elsewhere, so here are five that I can watch over and over again, in no particular order: Hero, Mr. Vampire, Reign of Assassins, A Chinese Ghost Story, and The Bride with White Hair. I’ll keep recommending other films at my author blog at frabjousdave.blogspot.com with links on Facebook and Twitter. FR: Given your work with role-playing games, I’m going to go out on a limb and guess that you’re probably in a game or two right now. What games are you playing? DG: While I have a local gaming group who’ve played in the Pathfinder setting with both D&D and Pathfinder rules, we often go on hiatus when I’m on deadline. Lately we’ve begun the first installment of the Jade Regent Adventure Path. I’m also a fan of but rarely get to play Call of Cthulhu, Star Wars Saga edition, and World of Darkness, among other systems. Usually I get my gaming fix from board games, most of them equally geeky. DG: Judging from recent releases, Paizo should have a PDF and ePub version of Master of Devils available for purchase at their site around the time of the physical book’s release in late July or early August. While they don’t currently distribute via Kindle, free apps like Calibre can convert ePub files to Kindle format. FR: Thanks so much for chatting with us, Dave! Flames Rising readers, be sure to check out Dave’s essay on dark fantasy and kung fu movies as well — the two may have more in common than you think! Keep an eye out for Master of Devils, appearing soon on bookstore shelves near you.